Last night at the American Hydrangea Society meeting, I had a moment of nostalgia for the past. 97-year-old Margaret Moseley was in attendance, having the time of her life signing books about the story of her wondrous garden. 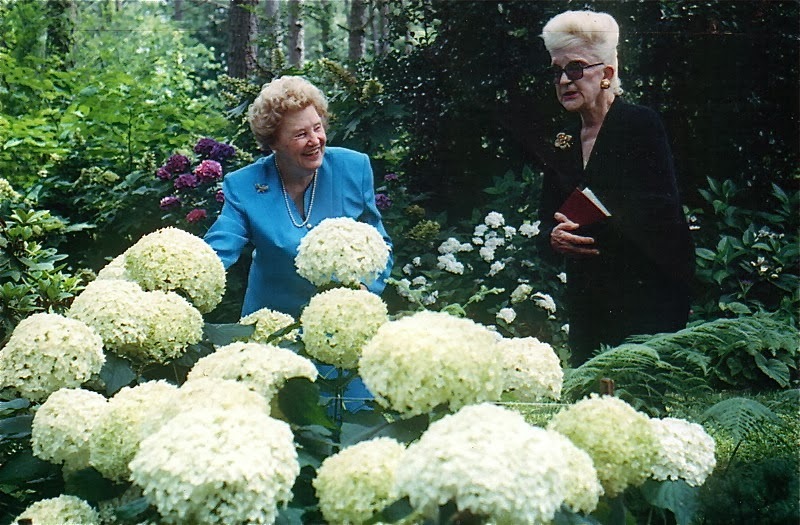 But, like Margaret, I so missed her dearest friend Penny McHenry, who founded the organization and who was known so fondly as The Hydrangea Lady. If you have a Hydrangea macrophylla 'Penny Mac' or a 'Mini Penny', then you have a shrub that originated in Penny's garden, Hydrangea Heaven. Going there in June was almost too much for the heart. Every hydrangea was more beautiful and showier than the next. Penny had fallen in love with hydrangeas after she had planted some florist types in her pine-shaded back yard in 1975. She began to notice that one type kept blooming into November. Some of the flowers would fade to a lovely deep purple, but other new ones would be bright blue, as if it were early June. Penny started layering the shrubs and soon filled her back yard with these special hydrangeas. It was at this point that I did an article about her for the Atlanta Journal-Constitution. But, it wasn't long until Penny began collecting other hydrangeas until she had just about every named variety. She acquired all the other species that would grow in Atlanta, as well. Her display of hydrangeas was so spectacular that Southern Living magazine put a scene from her garden on the cover. Penny, who had been an actress, had a marvelous deep voice and was vivacious and funny. She promoted hydrangeas with the utmost enthusiasm and became a well-known lecturer. Like Margaret, she was a media darling, and she was featured in many articles in magazines and newspapers. Also like Margaret, Penny starred in two episodes of A Gardener's Diary on HGTV. Because her hydrangeas kept producing all through the season, florists would come to buy blooms from her well into the fall. Dr. Michael A. Dirr visited her often and took cuttings. Her original 'Penny Mac' became not only a best seller, but was used by Dr. Dirr to hybridize other re-blooming hydrangeas. 'Mini Penny', a lower growing version of 'Penny Mac', was patented by Dr. Dirr. It, too, is a best-selling hydrangea. It was Penny who introduced me to Margaret Moseley. The two became the best of friends and often made appearances together, promoting hydrangeas in local nurseries. Sadly, Penny died in 2006, but her influence was felt last night at the American Hydrangea Society meeting where the book, Margaret Moseley's A Garden to Remember, was introduced. I love the above photograph which appears in the book about Margaret's garden. Carolyn Krueger, a former Atlantan and garden enthusiast, took the picture on June 21, 1999. I never knew this fact until just recently, but the two celebrity gardeners were in Margaret's garden, waiting for a ride to the memorial service for my husband, who had died suddenly on June 17. Though the occasion that day was a sad one, I cherish this photograph because it captures the vitality of these two gardening greats, who had such an influence on so many of us and who have given us some very special hydrangeas. Next May, Elizabeth Dean and Gene Griffeth of Wilkerson Mill Gardens will offer the white-flowering Hydrangea macrophylla 'Margaret Moseley' for sale at their nursery and on www.hydrangea.com. "To my dear friend Margaret, whose heart touches everyone she meets and whose soul belongs to every plant she touches." "And in memory of The Hydrangea Lady, Penny McHenry, who graced the gardening world with her kindness." Martha, they were waiting for me, I remember that day well. These two ladies were my best friends! How I miss those days.